The Grand Canyon is a steep-sided gorge carved by the Colorado River in the United States in the state of Arizona. 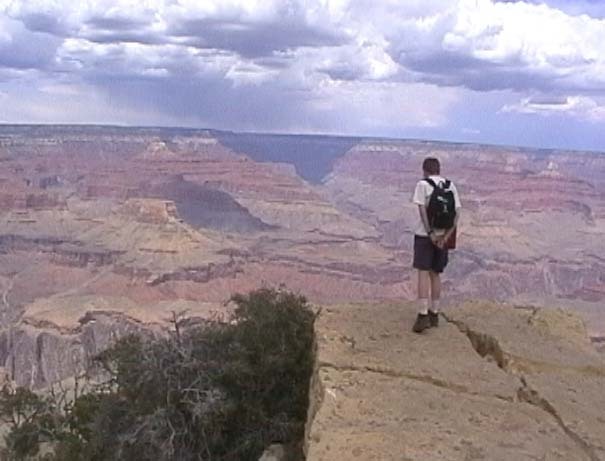 It is largely contained within the Grand Canyon National Park, one of the first national parks in the United States. President Theodore Roosevelt was a major proponent of preservation of the Grand Canyon area, and visited it on numerous occasions to hunt and enjoy the scenery. The Grand Canyon is 277 miles (446 km) long, ranges in width from 4 to 18 miles (6.4 to 29 km) and attains a depth of over a mile (1.83 km) (6000 feet). Nearly two billion years of the Earth’s geological history have been exposed as the Colorado River and its tributaries cut their channels through layer after layer of rock while the Colorado Plateau was uplifted. While the specific geologic processes and timing that formed the Grand Canyon are the subject of debate by geologists,recent evidence suggests the Colorado River established its course through the canyon at least 17 million years ago. Since that time, the Colorado River continued to erode and form the canyon to the point we see it as today. Before European immigration, the area was inhabited by Native Americans who built settlements within the canyon and its many caves. The Pueblo people considered the Grand Canyon (“Ongtupqa” in Hopi language) a holy site and made pilgrimages to it. The first European known to have viewed the Grand Canyon was García López de Cárdenas from Spain, who arrived in 1540.